1. Toast the freekeh mix in a frying pan set over a medium-high heat for 5-7 minutes, until dark brown. Add 500ml water and boil rapidly for 5 minutes until evaporated. Gradually add more water (about 300-400ml) until the grains are tender and dry – about 5-10 minutes. 2. Meanwhile, set another frying pan over a high heat and cook the chicory, cut side down until slightly charred. Transfer to a bowl and cover with clingfilm and allow to wilt. 3. 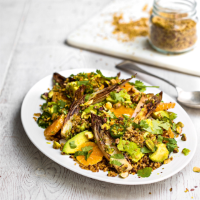 Mix the coriander seeds with the coriander stalks, jalapeños, avocado oil and clementine juice to make a dressing. Season well. 4. Toss the chicory with the freekeh mix, dressing and remaining ingredients. Then scatter over the pistachios and serve.